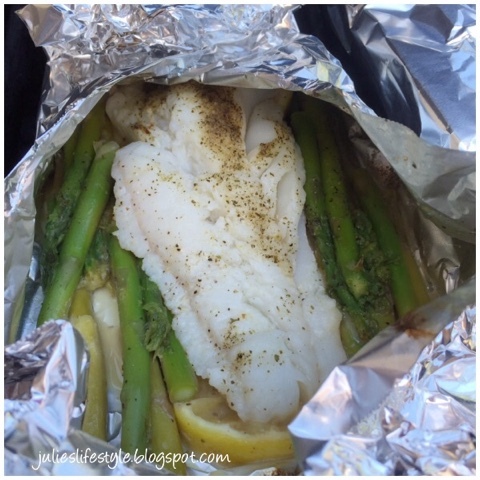 I recently made these fish packets for dinner and they tasted so good! In my family I love making easy meals that are healthy and taste delicious. This is a light meal to make for dinner that everyone will love. These grilled fish packets would even be perfect to serve for a get together this summer. These fish packets are so easy to assemble and dinner can be ready in minutes. 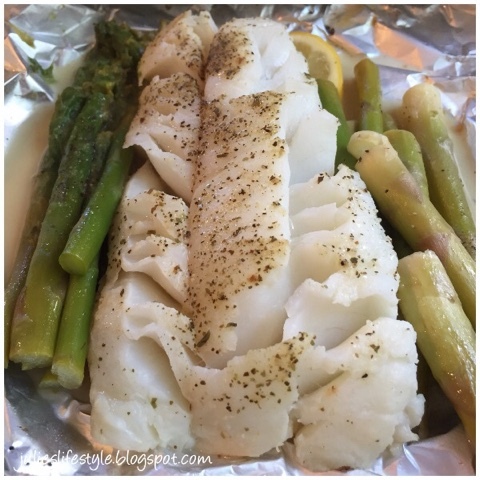 Here is the recipe to make cod fish with asparagus. Take one sheet of tin foil and spray with cooking spray. 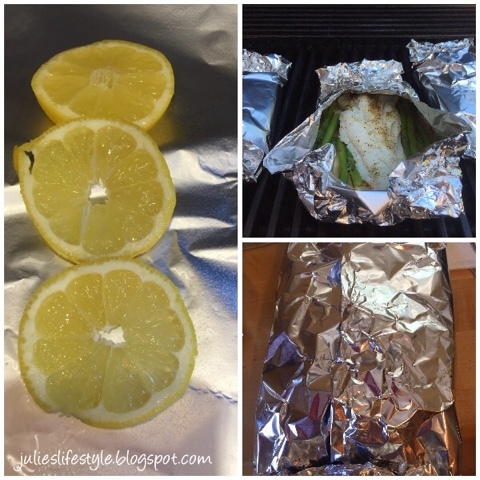 Place 3 lemon slices on foil sheet, then add fish on top of lemons. 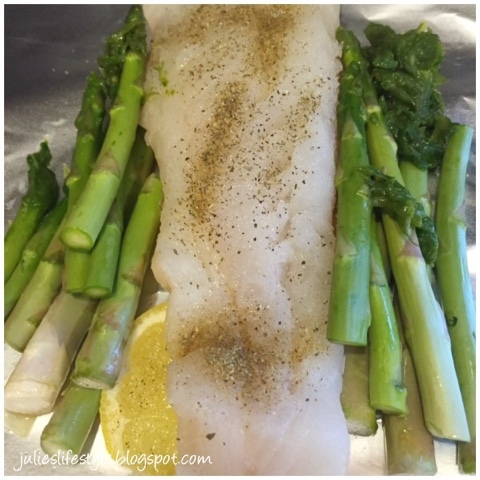 Add asparagus on both sides of fish. Drizzle olive oil and lemon juice on top of everything. Wrap up foil packet. Assemble the same way for each packet. Place packet on grill set to medium for about 15 minutes or until it looks cooked enough. To see more of my easy to make recipes, you can click HERE! Thanks for stopping by and have a wonderful weekend. Jess and I will see you all back here on Monday for our Cooking and Crafting with J & J Link Up! These look tasty and healthy! I haven't grilled at all yet! I am so behind with the summer activities!! white-fillet fish and asparagus..my fave, Julie! It's yum and healthy..
That looks delicious! Thanks for sharing with us. Delicious! I never tried it with asparagus but will do next time. At home we usually cook chicken breast and vegetables in foil packets. Healthy and tasty summer recipe, very easy to cook. I love the ease of foil packed meals, Julie, and I'm going to make this one. I have some tilapia in the freezer that would be good for this. Thanks for the inspiration!! Easy and quick clean up too. Win win! We have fish at least once a week so adding this to the grill menu. Thanks for sharing today on Book Wino. Julie, this one looks beautiful...and delicious. I am showing my fish loving and grill living husband this one! Off to pin. Thanks!! Happy summer!! These look delicious and I'm with Michelle, the easy clean-up gets major brownie points too! Have a wonderful weekend! I had completely forgotten about the ease of cooking the whole meal together in a foil package, thank you Julie! Yours look really easy and good! Quick and easy and yummy, too! I'm definitely going to try this. The grill makes everything so easy, doesn't it? My oldest is big on these foil packs and they always turn out great! this sounds and looks delicious Julie. Oh, I would love to try this for supper one evening. Packet meals on the grill are a favorite of ours, but we have never tried fish. Thanks for sharing! Hugs! Packet meals are so easy, and who doesn't love that? Oh Julie Yum two of my faves. Oh wow, this looks and sounds superb! I love asparagus too! Delicious! So simple too which is perfect for this time of year isn't it! I sure hope one of those packets are for me, I can almost taste the awesome flavor of this delicious fish and asparagus. I really appreciate you sharing with us at Full Plate Thursday and hope you have a great weekend! Easy and healthy are the two magic words! This looks great, Julie! I'm pinning, and plan to give it a try! My favorite kind of meal and yet I have not tried it on the grill. Thanks for the easy recipe! Me encanta el pescado y amo los espárragos. Se ve apetitoso. Acá sufriendo con el frío del Hemisferio Sur. That sounds and looks delicious Julie. I like to wrap up some sliced onion, a blob of butter, lay some salmon on the top and put some sliced onion on top of this along with half teaspoon of dill sprinkled over the salmon and onion. Wrap this up and cook on the grill, serve with new potatoes and a salad with the sauce generated from the dill and onions drizzled over the potatoes. Yum!! Quick, easy and healthy, what more could you ask for. Thanks for sharing with us at Throwback Thursday, Pinned! Looks yummy! I love to make packet meals on the grill, so easy and full of flavor. My husband is not fond of asparagus but I certainly enjoy it. Your fish turned out beautiful, Julie. I love cooking fish in packets - this looks like one incredible meal! Thanks for sharing with us this week at Throwback Thursday!! Hello my dear friend. Oh Julie. I love these kind of recipes. Still a bit cool for grilling here but I love doing these in the oven too. I found they work well in a frypan too. Thanks so much for sharing at Thriving on Thursdays last week. I'm featuring this one at tomorrow's party. Have a great week. OMG this looks sooo yummy! This looks good!! I might try it while I'm camping!! Thanks for sharing on My 2 Favorite Things on Thursday! Pinned! I'm sure many of your readers will be so excited to try this recipe! These foil packets look yummy! What a great way to eat fish and not stink up the house! Love it! Thanks for sharing at my Creative Ways Link Party! What a wonderful summer recipe! Thank you for sharing at Home Sweet Home! My husband loves fish so I can't wait to make this for him. Thank for sharing with us at the Plant-based Potluck Party! Pinning this! Our weather hasn't been that great for barbecuing so far but we are enjoying the days the weather is nice! 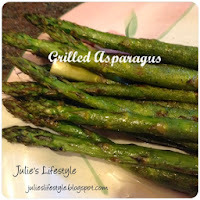 Your Grilled Fish with Asparagus looks delicious, Julie. I've cooked fish in foil packets in the oven but never on the barbecue. I can't wait to give it a try. Thank you for sharing with us at the Hearth and Soul hop.